Whenever people ask me how best to transition to this way of eating, I always recommend curries. They're great whether you're starting this journey or want to introduce others to the lifestyle and are useful additions to the repertoire for those who are old hands at living this way. Curries are naturally packed with flavour and feel like a treat thanks to their association with takeaways, plus they work really well with a veggie base. 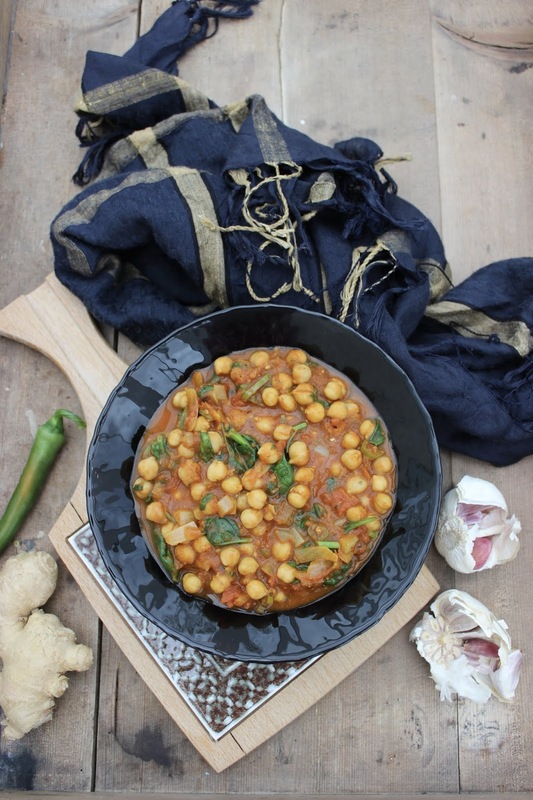 For those reasons, everyone should have a good channa masala recipe and I really hope that this version will become your go-to. 1) Heat the coconut oil in a large pan over a medium heat on the hob. Add the onion and lightly fry for a few minutes until softened. 2) Next, add the garlic, ginger and green chillis and stir over the heat for a further minute. 3) Stir in the spices (garam masala, ground cumin, ground coriander, chilli powder and ground turmeric). Note that the mixture will be very dry at this point. 4) Add the tomato puree, followed by the chickpeas and tinned tomatoes and stir to combine. Swish 300ml water into the empty tomato tin and add to the pan. Simmer for 20-30 minutes. Season with salt & pepper. 5) Add the spinach, coriander and lemon juice and stir, cooking until the spinach is just wilted.